Awesome Daruma Buddha, from Shungo in Yokohama! Daruma is the Japanese name of the Bodhidharma, a 5-6th century CE Buddhist who is said to have established Chan (Zen) Buddhism. His origins are disputed, and he is often portrayed as somewhat ill-tempered and crazy. He is also known as the “blue-eyed Barbarian” in some Chinese texts. I like how Shungo captured all of that, even the blue eyes, in this etegami. 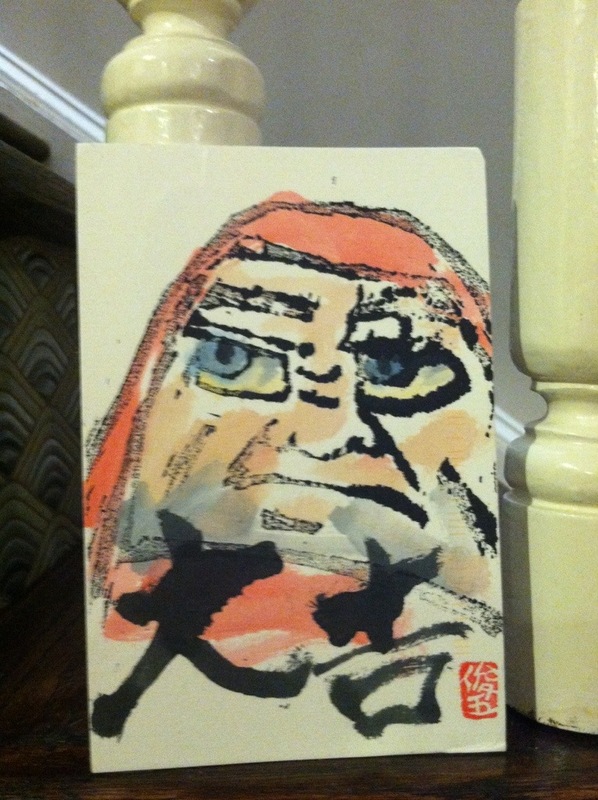 In Japan, there are daruma dolls, looking much like Shungo’s card, that come with the eyes blank. The idea is, you buy one, make a wish, paint in one eye, and then when the wish comes true, you can paint in the other eye.